AMMONNEWS - His Majesty King Abdullah on Wednesday commended the projects and achievements of a number of students at the Hashemite University in Zarqa. 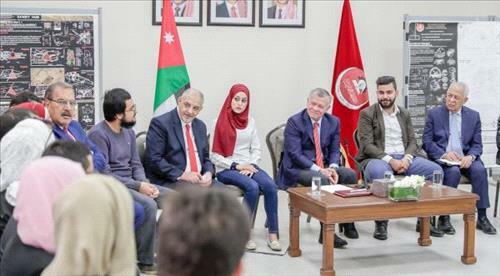 During a visit to the university, which was established in 1991, King Abdullah was briefed on innovative projects by students there in the fields of water, energy, and agriculture, and spoke to a group of them, stressing the importance of supporting their efforts to serve Jordan. His Majesty told the students that their projects prove Jordanians can achieve a lot through self-reliance, expressing optimism in the future due to young people’s diligent efforts to seek innovative solutions to current problems. The King also commended the administrative and academic staff of the Hashemite University, where 24,000 students are currently enrolled, for focusing on scientific research, which is key to innovation. Commenting on a project by a student to manufacture a solar-powered car, His Majesty stressed the importance of enabling excelling Jordanian youths and students to intern with international companies working in ICT and modern industries to get a first-hand look at their expertise and bring what they learn back to Jordan. The King affirmed his confidence in the ability of young people to continue Jordan’s march towards further progress and achievements, calling for empowering them and equipping them with the necessary skills and expertise to play an active role in political, economic, and social development. His Majesty also noted the important role of youth in raising awareness of the danger of violence, extremism, and drugs. Discussing the challenges facing Jordanians, the King said work is underway to address economic challenges, poverty, and unemployment, with the aim of improving citizens’ living standards, providing job opportunities, and attracting investments. His Majesty added that the UK will host a conference next year to support Jordan’s economy, in appreciation of Jordan’s important global role. The King stressed that Jordan’s efforts are supported and appreciated by the international community. During the meeting, students highlighted the projects they have been implementing at the university through scientific research programmes on water, energy, and agriculture, as well as those related to enriching Arabic content on the Internet. The students said they are networking with local communities and other universities to exchange expertise and opinions on national concerns, and to benefit from new ideas and initiatives for development. During the visit to the Hashemite University, His Majesty toured a solar-powered water desalination plant established by the university, which produces 650 cubic metres of water per day. University President Kamal Bani Hani also briefed His Majesty on how the university, through its various projects, has managed to reach self-sufficiency without requiring direct financial support from the government. Bani Hani said the university is not in debt or paying back loans, and it is working on increasing its investments, citing plans to earmark JD4 million for an investment fund. He added that the university allocates 6 per cent of its budget to support scientific research, noting that it established a five-megawatt solar power plant in 2016 that has since reduced its annual electricity bill from JD2.5 million to zero. The university was able to recoup the project’s cost in a year and a half, and it is working on establishing two more solar power projects, according to Bani Hani. Royal Hashemite Court Chief Yousef Issawi and Adviser to His Majesty and Director of the Office of His Majesty Manar Dabbas accompanied the King on the visit.